Prepare filling by browning the pine nuts in butter. Remove the pine nuts from the butter and set aside. In the same pan brown 1⁄2 pound of the ground beef or lamb and onions. Drain the fat. Add the pine nuts, mix in the raisins and/or walnuts if desired. Set aside. 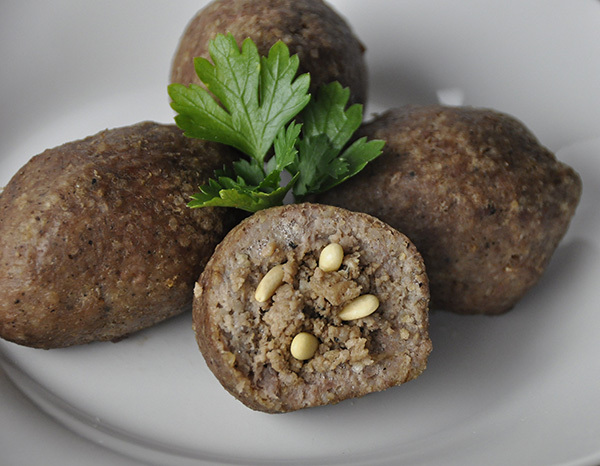 Prepare Jemila Kibbee Mix using 1 lb of lean ground beef or lamb according to instructions on the package. Shape into 2 “ balls in the palm of your hand. Hollow each one out leaving an opening in one end. Stuff each with filling then pinch closed. Bake on greased pan in 450 degree preheated oven for approximately 30 minutes. call 800.729.0764 and leave a message and we’ll call back ASAP.